It doesn’t matter if you have school-age children or not, everyone benefits from good schools. Education is the key to upward mobility, and that’s the kind of opportunity that makes communities great. Think about it, where would you rather live? A place where the status quo is acceptable? Where people just get by, because that’s what their parents did? Or a place where people are constantly striving for more? A place where people work to be better themselves, and provide even more opportunities for the next generation. Here in Moore County, we understand the value of high quality education and how it directly impacts our community’s long-term vitality. As such, there is tremendous focus on our schools, evidenced by the fact that in November 2018, Moore County voters approved a 1/4-cent (.25%) increase to the local sales tax rate for the purpose of generating revenue to support the construction of new schools. The increase is projected to generate $2.5 to $3 million annually. We are also fortunate to have active involvement from our parents—a key ingredient to success. The result is one of the top performing systems in North Carolina, and a clear leader in the region. With 23 schools and a current enrollment of 12,850 students, the Moore County School System is large enough to benefit from its size and leverage the latest technologies, but small enough that students don’t get lost or overlooked. In addition to the three existing high schools in Moore County, plans are underway for a new 800-student Advanced Career Center high school on the campus of Sandhills Community College. This innovative school will offer special curriculum pathways to prepare students for careers in Health Services, Skilled Contracting Services, Global Leadership, and STEM (Science, Technology, Engineering, and Mathematics). Students will be able to earn college credits and industrial certifications and licenses to prepare them for progressing to post-secondary education or directly into the workplace. In addition, students will be required to take general courses in business and personal marketing (soft skills development). Students who enrolled in the new school would remain affiliated with their home schools and attend the Career Center for part of each day before returning to their original campuses for basic studies and extracurricular activities. The Advanced Career Center will profoundly enhance educational and economic opportunities in our communities. It will also enhance workforce development opportunities by cultivating talented and skills workers and helping to create sustainable jobs. Charter schools, which receive public funding on a per-pupil basis but operate independently, give Moore County parents a choice in education. 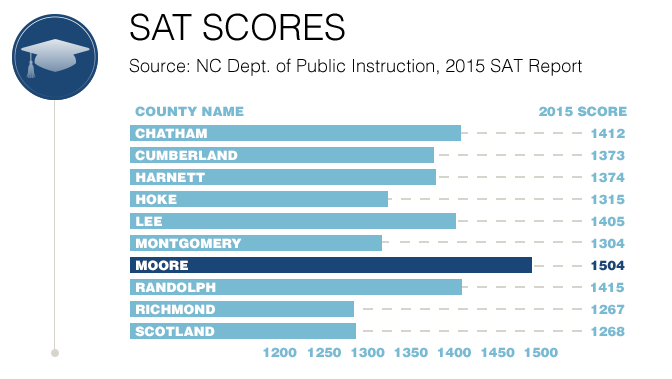 Moore County has 3 charter schools, each with a charter specifying the guiding principles, governance structure and accountability measures for the school. Charter schools follow curriculum, standards and policies set forth by the State of North Carolina.